The government of former Khmer Rouge commander Hun Sen carried out a major political crackdown in Cambodia in the months leading up to this week’s East Asia Summit as President Barack Obama met with the leader in Phnom Penh. U.S. officials said the crackdown in the Southeast Asia state was aimed at muzzling critics of the Hun Sen regime and took place over the past six months. The actions included imprisoning a critical radio broadcaster; attacking a United Nations human rights report that called for democratic elections; and stifling broadcasts by U.S.-funded Radio Free Asia (RFA) and Voice of America (VOA), whose broadcasts were deemed "anti-government." Calls for Obama to boycott the summit due to the government crackdown were ignored. Obama held a "tense" meeting on Monday in Phnom Penh with Hun Sen and urged him to release political prisoners and hold free elections, set for next year, according to White House Deputy National Security Adviser Ben Rhodes. Hun Sen was a leader of the Khmer Rouge, a communist organization set up by the North Vietnamese People’s Army. He has continued to use strong-arm tactics as prime minister under the ruling Cambodian People’s Party (CPP). The Khmer Rouge ruled Cambodia from 1975 to 1979 under Pol Pot and engaged in communist nation building, which resulted in a genocide that killed an estimated 2 million people. Rhodes said the meeting focused mainly on human rights issues. Obama "began by expressing that his trip to [neighboring] Burma demonstrated the positive benefits that flow from countries moving down the path of political reform and increasing respect for human rights." Rhodes said Obama raised the issue of imprisoned radio broadcaster Mam Sonando, who was convicted of "secessionism" Oct. 1 and sentenced to 20 years in prison. "He said that those types of issues are an impediment to the United States and Cambodia developing a deeper bilateral relationship," Rhodes said. Hun Sen dismissed a report by U.N. Special Rapporteur for Human Rights Surya Subedi that was critical of the Cambodian electoral system. The Cambodian government also recently told officials of RFA and VOA to cease broadcasting critical reports of the government. Opposition legislator Mu Sochua asked Obama last month to consider canceling his participation in the East Asia Summit, which began Monday, unless the government agreed to reform the electoral system. She warned in a public appeal that the Hun Sen government would use the president’s visit as a sign of U.S. government "endorsement and support" for the upcoming 2013 election. Dissidents in Cambodia also have called for the government to allow exiled opposition party leader Sam Rainsy to return the country. Human Rights Watch said in a recent report that over 300 people have been killed in politically motivated violence since 1991 while no one has been convicted for the murders. Brad Adams, a Human Rights Watch specialist on Asia, said Hun Sen used death squads to target opposition politicians, labor leaders, and journalists. Adams stated in a recent Wall Street Journal article that Hun Sen, in response to democratic protests in the Arab world, said of his opponents: "I not only weaken the opposition, I'm going to make them dead … and if anyone is strong enough to try to hold a demonstration, I will beat all those dogs and put them in a cage." "The U.S. and other governments issue critical statements from time to time, but they have no strategy or policy to ensure pluralism, the protection of opposition politicians and critics, or an end to the violence and impunity that characterize contemporary Cambodia," Adams said. Adams said Obama’s failure to speak out against human rights abuses in Cambodia would be a "huge missed opportunity that would significantly tarnish Obama’s second term. …"
"Quiet diplomacy will not be enough, as the government will use its near monopoly of the media to say that the president of the United States left town without making any demands on the government," he said. "Such a visit, complete with smiling photo-ops, would give Hun Sen and the CPP the international legitimacy they have long sought." More than 70 human rights groups last week protested the Cambodian government’s crackdown head of the Association of Southeast Asian Nations Summit (ASEAN) in Phnom Penh. "We, the undersigned civil society organizations, strongly urge the Cambodian authorities to immediately end the ongoing intimidation, threats and harassment of organizers, venue owners and participants involved in civil society events in Cambodia’s capital, Phnom Penh ahead of the 21st Association of Southeast Asian Nations (ASEAN) Summit and the 7th East Asia Summit," the groups said in a statement. "We strongly urge the Cambodian authorities to respect the fundamental rights to freedom of expression and assembly in accordance with their constitutional and international obligations, in particularly in view of rising concern that it will heighten its crackdown on these fundamental freedoms ahead of the two summits." Human Rights Watch condemned the imprisonment of Sonando and other government critics in October, stating they were held on false charges. The group demanded their immediate release. Human Right Watch also called on world leaders to boycott the summit. Another regional human rights group, the Asian Forum for Human Rights and Development, also criticized the broadcaster’s imprisonment and said in a statement that the Phnom Penh government should "stop its ongoing intimidation and threats" of critics. Obama arrived in Phnom Penh from Burma where U.S. support for the military-backed government there has led to some reforms. Reuters reported that Hun Sen called U.S. concerns over human rights abuses "exaggerated." 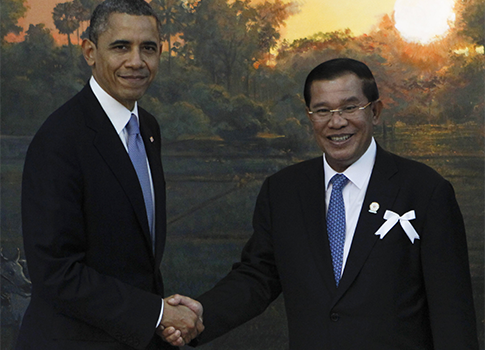 Hun Sen also asked Obama to forgive Cambodia’s $370 million debt to the United States. This entry was posted in National Security and tagged Barack Obama, Human Rights, Obama Administration. Bookmark the permalink.